The invention of the synthesizer in the mid-20th century inspired composers and redesigned electronic music. The synthesizer sped up the creation process by combining hundreds of different sounds, and composers were inspired to delve deeper into the possibilities of electronic music. Two Americans, Robert Moog and Donald Buchla, created separate companies to manufacture synthesizers in the 1960s. 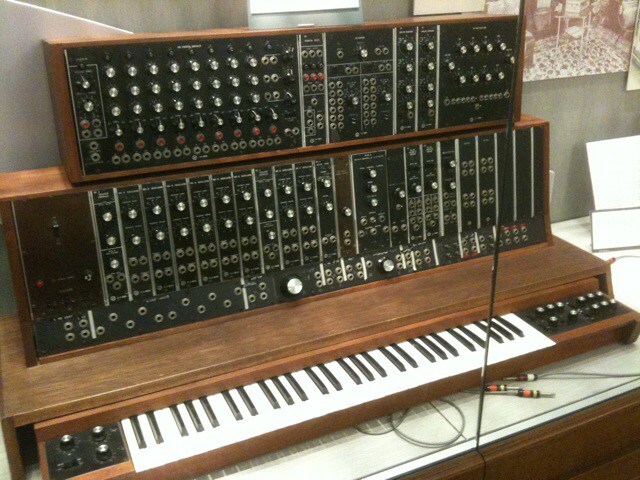 This vintage modular is the first commercial Moog synthesizer sold. It was built by Robert Moog using pear tree wood from his own back yard in New York. It has three control panels, a five-octave keyboard with fifteen knobs, a wood stand, and pedals. Early Moog synths were super temperamental. “They would go out of tune if it was too hot or too cold, or even if more people came in the concert hall,” David Borden stated. Bob Moog’s revered Minimoog was the first fully integrated synthesizer, and as such marked one of the most important developments in electronic music. Compact, affordable, simplified and based on the megalithic modular Moog synths, the Minimoog became the most popular synth of all time, and still is to this day! Prior to the Minimoog, synthesizers were custom built to order, and required a great deal of technical knowledge to be able to wire up and create a sound. The Minimoog changed all that by hard-wiring the most basic but essential of components into a compact keyboard any musician could not only play, but dial up some great sounds on! 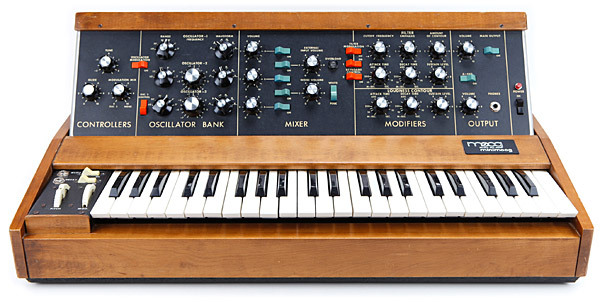 Thus, the Minimoog was the first synthesizer to show up on the shelves of music stores around the world. Its powerful, rich sound has more than stood the test of time, keeping second-hand prices sky high, and inspiring several developers to build software revivals of it. 1) Native Instruments Monark - Perhaps the king of all Minimoog emulations, Native Instruments’ Monark is an Ensemble for Reaktor and Reaktor Player - deployable as a plugin or standalone - that painstakingly models every quirk and nuance of the real thing. 2) GForce Software Minimonsta - Minimonsta boasts not only polyphony but also additional LFOs and envelopes, the Melohman patch morphing system, a delay effect and external input for use as an effect. 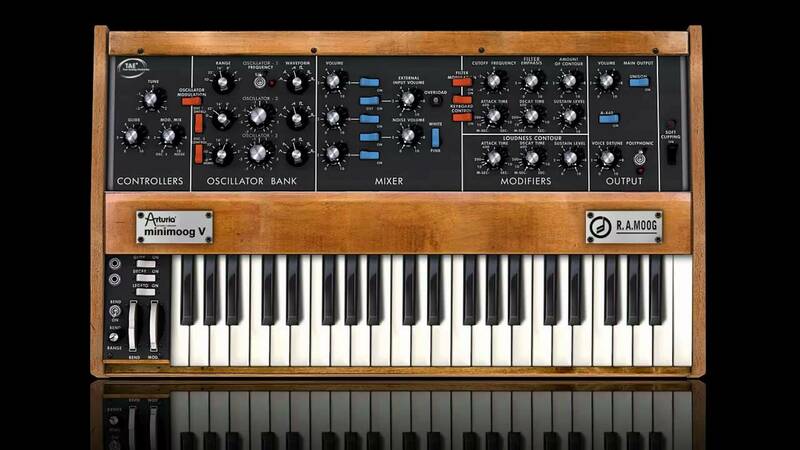 It sounds terrific, too, serving up a solid reimagining of the Minimoog Model D and including over 6000 presets. 3)IK Multimedia SampleMoog - For a quality sample-based take on the seminal monosynth, IK Multimedia’s SampleMoog uses its SampleTank engine to power no less than 16 virtual Moog instruments, including the Mini. 4) Arturia Mini V2 - Perhaps the best known of all the Minimoog emulations is Arturia’s popular Mini V2. Like Minimonsta, this one extends the capabilities of the real thing significantly, adding polyphony, a mod matrix, a formant filter, an arpeggiator, effects, its own parameter automation system and more. 5) u-he Diva - Counting every part of the Minimoog among its various modelled modules, u-he’s semi-modular masterpiece Diva is in a rather higher price bracket than the others here, but being arguably the finest virtual analogue synth ever made, you’d expect it to be. 6) Steinberg's ModelE - One of the first VST instruments ever made, way back in 2000. Obviously, it’s not the most powerful or convincing of faux Minimoogs, but given that you can download it for free as part of theVST Classics collection from Steinberg, there’s no reason not to give it a try.